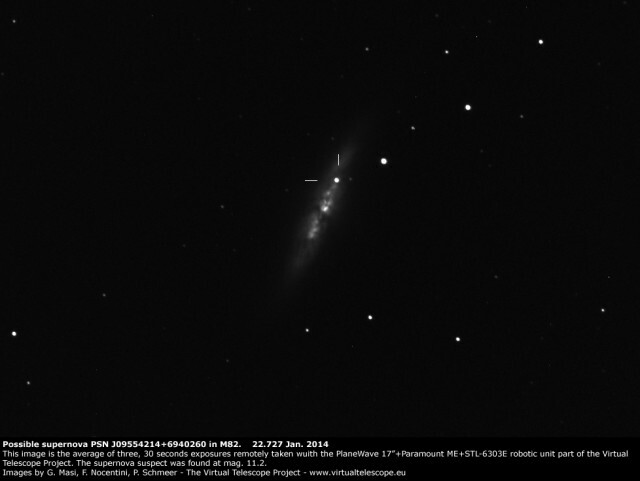 On 21 Jan. 2014 a possible bright supernova was reported in Messier 82, a well-know irregular galaxy in Ursa Major, and announced via TOCP by Central Bureau for Astronomical Telegrams. It received the temporary designation PSN J09554214+6940260. It was discovered by a team of students lead by Steve Fossey, University College London. On Jan. 2014 the CBAT gave it the official designation SN 2014J. As soon as the night arrived in Italy, the PlaneWave 17″ robotic unit was remotely used to image the transient. It was easily located in the image above, while shining at magnitude 11.2 in R band. Previous story Ganymede eclipses Europa (12 Aug. 2009): truly rare!